Nelson Mandela 18 July 1918 5 December 2013 South African Gadla Henry Mphakanyiswa Noqaphi Nosekeni Statesman, Peace activist, Actor, Lawyer, Writer, Social activist, Philanthropist The first black president of South Africa in 1994, serving until 1999. A symbol of global peacemaking, he won the 'Nobel Peace Prize' in 1993. 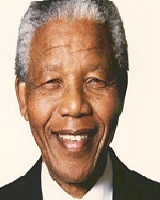 A list of popular nelson mandela quotes are given below.